Getting Results for Your Station from Facebook Ads. Digital consultant Chris Miller admits he was not a fan of Facebook ads when they debuted but now he says the Facebook ad platform has improved to the point where he can “use them to drive specific, direct response for clients who want to sell more cars, houses, wine, books and downloads.” Miller says that for a station event or remote, this is a very affordable way to zero in on whom you’re trying to reach. “Facebook will let you target your message pretty precisely, too. You can choose who you want to see your message by age, gender, zip code, and a host of other criteria. You can also choose exactly when and for how long your message will be posted, too. I keep this time period pretty short and pretty immediate, too. If I were promoting an on-air contest or on-site promotion, I would promote it for a day and a half or two days leading up to it.” For more advice on using Facebook ads, see Chris Miller’s entire piece here. Sun Broadcast Group Promotes Julio Aponte. Hispanic marketing pro Julio Aponte joined Sun Broadcast Group, Inc. earlier this year as director of Hispanic sales. Now, the company announces he’s being promoted to senior vice president of Hispanic initiatives. SBG says he’ll be in charge of researching, developing and launching new programming and affiliate partnerships exclusive to Sun Latino, its Spanish Language division. He will also oversee sales strategies as well as develop new measurement and accountability initiatives that will be implemented across the network. SBG CEO Jason Bailey says, “When we welcomed Julio to the Sun family earlier this year, I knew he would quickly become an important member of our executive team. In the short time that he’s been with us, he has been instrumental in helping us create Sun Latino, the #1 Spanish language network for news and information. Julio represents all the good that we believe this industry to be. He is so well liked and respected by everyone here in our family, and more impressively, by all those who have ever had the opportunity to work with him.” Sun Latino provides sales and promotional services for CNN en Español, Fox Deportes and customized, local weather forecasts with AccuWeather en Español. It is also home to MusiMundo, an all music network and InfoMundo, a national business and information network. WCKG, Elmhurst, Illinois to Be Purchased by GM Matt DuBiel. The suburban Chicago AM signal is owned by Joseph Gentile Inc. and is currently airing a slate of largely syndicated talk programming including Mancow, DirecTV/Fox Sports Radio’s Dan Patrick, GCN-distributed Alex Jones, and independently syndicated “Free Talk Live” with Ian Freeman and Mark Edge. General manager Matt Dubiel and Arthur DuBiel will pay $290,000 cash for the property. In addition to operating WCKG, DuBiel is also marketing the Q101.com website that features several alternative, rock and classic rock music streams under the brand of now defunct alternative Chicago station WKQX. WMEN, West Palm Beach Host Dan Sileo Apologizes for Bounty Tweet. “640 Sports” midday personality Dan Sileo was so incensed at Saturday night’s drubbing of his alma mater (University of Miami) at the hands of Florida State that he offered a $1,000 reward to any player who “takes out” Seminoles running back Devonta Freeman. According to CBSSports.com, Sileo Tweeted, “in 6 weeks…I will PAY A $1,000 BUCKS to ANY @hurricanesports PLAYER to TAKES THIS KID OUT #MHFREEMAN.” Sileo has since removed the Tweets and apologized, saying he didn’t mean to offer a bounty in subsequent Tweets. Talk Radio Diplomacy. 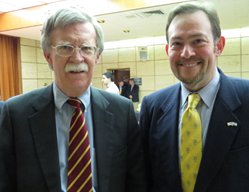 Former United Nations Ambassador John Bolton (left) is pictured here with Boston-based media personality Jeff Katz (who serves as a columnist for The Boston Herald and commentator for Boston Herald Radio). Katz was a featured speaker at a special Christians & Jews United For Israel event where John Bolton appeared as the keynote speaker.